The highlight of this limited edition deluxe boxed set is a stunning new 5.1 Surround Sound mix (exclusive to this set on an NTSC/Region Free DVD), along with a new stereo mix, from the original multi-track master tapes by Jakko Jakszyk and a new re-master of the original 1975 mix by Paschal Byrne. FISH OUT OF WATER also includes four bonus tracks of the single edits of “Lucky Seven” and “Silently Falling”, along with both sides of the 1981 single by Chris Squire and Alan White; “Run With the Fox” and “Return of the Fox” (appearing on CD for the first time). 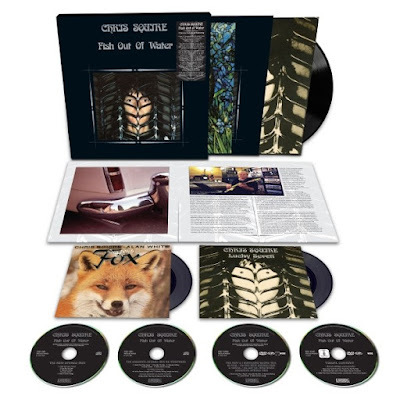 The boxed set also includes a replica 180 gram gatefold LP with poster of FISH OUT OF WATER (mastered and cut from the original tapes at Abbey Road studios), along with two seven inch singles of “Lucky Seven” b/w “Silently Falling” and “Run With the Fox” b/w “Return of the Fox”, both in picture sleeves. To complete the content is a visual DVD (NTSC/Region Free) featuring the 1975 FISH OUT OF WATER promotional film featuring the songs “Hold Out Your Hand” and “You By My Side”, along with a 2006 interview with Chris Squire conducted by Jon Kirkman and a 2006 audio commentary by Chris Squire. Finally, the set also contains a 36-page book with an essay by Sid Smith featuring exclusive interviews with Bill Bruford, Patrick Moraz, Gregg Jackman and Jakko Jakszyk.